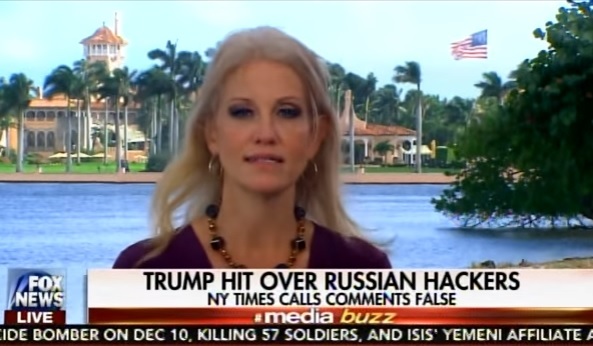 Donald Trump campaign manager Kellyanne Conway went on Media Buzz on Sunday with Howard Kurtz. Conway slammed the leftist CIA cranks who have leaked alleged Russian interference reports to the liberal media. Kellyanne reminded Howard Kurtz that the CIA leaked information to the press but refused to testify in Congress this past week on their allegations. Kellyanne Conway: Hillary Clinton is telling donors at her party or wake or whatever you want to call it that Russian hacking affected the election results. No it did not and she knows it. She ignored Wisconsin. She ignored Michigan where President Obama won by 10 points four short years ago and where Donald Trump just won. So if the intelligence community wants to be serious about this and produce evidence to the American people we of course will look at that. They were invited to a House intelligence briefing and didn’t show up. They would rather leak to the media. That should bother people… Come forward, go and testify where you should behind closed doors, and stop leaking to the media.